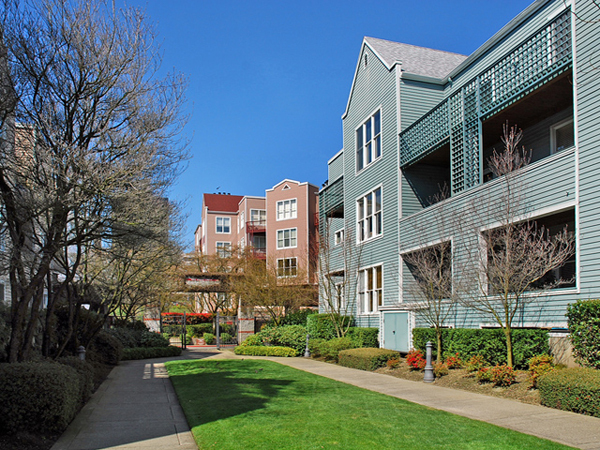 The Riverplace Condominiums are nicely located along Portland's downtown river front. Amenities include secured entries and parking, cable TV, terraces and a park like common area. Many units have a fireplace and several have wonderful views of the river. There are 8 listings found for Riverplace. LIVE AT RiverPlace! SOME RIVER VIEW. YOUR DOWNTOWN ONE BEDROOM CONDO W/ DINING ALCOVE ON SE CORNER. CONTINUOUS FLOOR TILES IN ENTRY, KITCHEN, BATH. CARPET IN LIVING/DINING/BEDROOM. WOODBURNING F/P W/ STONE SURROUND. TUB-SHOWER W/ SLIDING GLASS DOORS. BEDROOM CLOSET ORGANIZERS. SOUTH-FACING DECK ACCESS FROM LR & BR. DEEDED PARKING SPACE & STORAGE LOCKER. NEIGHBORHOOD AMENITIES: RIVER/MARINA/HOTELS/CAFES/SHOPS/STREETCAR. RARE 1B/1B w/OFFICE ALCOVE. SUNNY SE CORNER! Generous ENTRY. Serene interior COLOR PALETTE. F/P. Access DECK from LR & BR. Move-in ready: PAINT/CARPET/SS APPLIANCES/DUCTLESS HEATING & COOLING SYSTEM - like new! ORGANIZERS in HIS/HER BEDRM CLOSETS. Efficient PANTRY. 1 deeded PRKG SPACE + Storage Locker. ENJOY THE NEIGHBORHOOD: Steps to the RIVER/HOTELS/CAFES/SHOPS/STREETCAR + nearby CULTURAL DESTINATIONS! Large garden level corner unit in gated Riverplace condominiums. Italian tile floors and wood burning fireplace, large master shower, plus tub and shower in 2nd bath. Deeded parking. Shops and restaurants along the waterfront. RiverPlace:1 OF A KIND-2B/2B CORNER CONDO NESTLED ABOVE GARDEN COURTYARD.DUAL-TYPE MASTER SUITES! SPACIOUS ENTRY - ROOM FOR LIBRARY/DESK. LIGHT, BRIGHT MASTER SUITE. KITCHEN WINDOW. DINING ROOM ALCOVE IN GREAT ROOM. WOOD-BURNING F/P. LIVING RM ACCESS TO BALCONY. HEAT PUMP FOR HEATING & COOLING. ALL APPLIANCES INCL. FRESH PAINT. MOVE-IN READY! 2 DEEDED PARKING & STORAGE. STEPS TO RIVERWALK - CAFES, SHOPS, HOTELS. ENJOY NEIGHBORHOOD!! 1184 sq. ft. remodeled two bedroom, two bathroom unit with southern exposure. Two decks, wood burning fireplace, lots of built-ins and a chef's kitchen with granite counter tops. Master suite includes deck, walk-in closet and bathroom. Beautiful gardens throughout the complex. Walk to Riverplace Esplanade, marina, hotels, shops and restaurants. Living at Riverplace is like being on vacation. Extra storage and deeded parking space. True Downtown Riverfront Condo with Willamette and Bridge Views from Two Decks. Top Level Unit. Instant Access to Waterfront Parks, Shops, Restaurants, Marina. Contemporary Remodel. Vaulted living room with fireplace, deck. Charming dining room. Remodeled kitchen with breakfast bar. Family room with bar, bath, deck. Two garage spaces. Click Vtour link for room by room brochure, walk thru and aerial video. Incredible Portland Habitat.